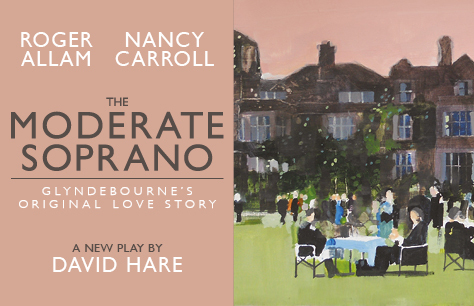 David Hare’s The Moderate Soprano, first seen at the Hampstead Theatre, transfers to the West End. Roger Allam and Nancy Carroll reprise their roles in the West End transfer of The Moderate Soprano at the Duke of York's Theatre. The two great passions in John Christie’s life were opera and a beautiful young soprano, Audrey Mildmay, with whom he was completely smitten. Together with his formidable drive, they fuelled what many first saw as a monumental folly in the South Downs. Glyndebourne was triumphantly born amidst stiff Manhattans, rolling lawns and the sound of sheep from across the ha-ha. It was to become revered the world over. Such was the scale of the enterprise that love alone was not enough. When a famous violinist was fogged in overnight in Eastbourne, Christie first heard of a group of refugees for whom life in Nazi Germany had become impossible. Perhaps they could help deliver Christie’s vision of the sublime – assuming, of course, they would be willing to cast Audrey as the leading light. The Moderate Soprano tickets are available now. The transfer from Hampstead Theatre has a limited 12 week run at London's Duke of York's Theatre! As I was an American visitor to London, this wasn't a play I knew about -- but I was looking for a matinee and "Moderate Soprano" looked interesting. I'm so glad I saw it!! It was a theatre experience for adults who have enough historical memory so that the references to the dark 1930's could reverberate. The script was excellent and the acting was superb. It provoked laughter at the British stereotypes, but the actors were equally adept at evoking pathos. The theatre itself is charmingly old-fashioned, and I took advantage of the ice cream sold at intermission!! Over-acted, under-written, cliche-infested. Dull. Kept awaiting the play to start. Recommend- don’t bother. But then, last night was its close.